waffling between fear and joy. fear in being one day closer to the grave. with the scrutiny of a true professional. "can things go bad really fast?" she threw herself into living life with gusto. the clouds of questions that swarmed around her. she made living with terminal cancer look easy. she made living with a terminal illness look normal. there's nothing normal about living with disease. when they complete 4, 6, 8, or 12 chemotherapy treatments. cheers are given at the end of a year of herceptin. although there is incredible encouragement. means to endure 1,250 days of non-stop treatments. and then she died at age 32.
we're all left wondering how this could be. we all forget how sick we really are. "i had no idea she was so sick!" "i can't believe she's gone!" that's the insidiousness of the disease. looming off in the distance. I interviewed a woman to learn her story about early stage breast cancer. She gave me permission to share her story, provided that I changed it enough to where she would not be able to be identified. I have changed her demographics a bit, but all her comments are untouched. Sally is a divorced mother of three children (two living at home) and was diagnosed with Stage 1b breast cancer about two years ago. She lives in a small Midwestern town and works as a custodian in a local middle school. While she was not happy about having breast cancer, she immediately embraced the pink ribbon with enthusiasm. For some reason, it took three months for Sally to receive a treatment plan for her cancer. When I questioned her about this, she couldn’t really explain why. She talked about how she had a hard time receiving information from her medical team. Sally seemed to have trouble understanding the basics of breast cancer itself. I suspect there were some insurance issues involved as well. During those three months, Sally opened a fund-raising page for herself. As an hourly worker, she knew that if she lost any time working, she would lose income. However, because there was no treatment plan, people accused Sally of fraud and had her page shut down. Sally threatened to shave her head in order to add credence to her story. “I contacted Komen and they had nothing for me. I was working and not in treatment, therefore, I was not in need of any help. I tried to explain that I was concerned about when I was in treatment that I would no longer be able to work and I was told that I needed to wait and see if that would happen. I worried about being able to pay my rent and about being able to feed my teen boys. I also contacted The Pink Fund and was told I didn’t qualify with them, either. “I don’t really understand. I’ve seen those pink ribbons for years, never really knowing much about breast cancer. Now that I’m a part of ‘the club,’ I’m finding that I still don’t know much. No one helped me. I did end up getting sick and I had to go to the emergency room once. I ended up dropping to part time until the end of chemo. "I had friends post on social media that I was brave and strong. I didn’t feel brave or strong. I was the same person I was before I got cancer and no one called me brave or strong then. “I still don’t feel like I belong. In fact, I feel more isolated than ever. Being accused of fraud really hurt me. Being rejected for financial aid simply because I hadn’t started treatments yet also hurt. Fortunately, my ex-husband stepped in to help out with the boys. No matter what differences he and I have had, he has always been a great dad and I’m grateful for that. “Someone told me I should have reapplied for financial aid once treatments began. Maybe I should have. By then, I was so tired that I really couldn’t see myself past the immediate day. Sally is still trying to put her life back together. She’s back working full time, but feels she is more subdued these days. She doesn’t know what comes next and like so many others who have had breast cancer in the past, lives her life one day at a time. She doesn’t feel any sense of a comradery with others with breast cancer, other than a casual, “Me, too,” and has no desire to be involved in any sense of advocacy. The next installment of “The Invisible Breast Cancer Patient” will address breaking through barriers that keep the community from seeing each other. As most people in social media's breast cancer land know, Jody Schoger died the morning of May 18, 2016. Ever the picture of grace and acceptance, Jody didn't ask anyone to fill her shoes when she was gone, but she asked that we continue her mission -- to know, love, and accept those with breast cancer of all stages and to provide them with safe haven wherever we are. Jody's specialty was the social media platform, Twitter. There is much that can be written about Jody, but I'll leave those legacy tributes to those who knew her much better. In spite of my being active on social media since being diagnosed with breast cancer (and even before that), I'm a dud at Twitter. It took me until January of this year to even learn what the hashtag #bcsm, even meant. Twitter makes my head spin and I don't use it very often. However, the focus of this post is about the disease, breast cancer, itself. Jody was diagnosed and successfully treated at age 43 for early stage breast cancer in 1998. As such, she is in the SEER databases as a Stage 2 survivor. She lived more than five years after her diagnosis. However, in April 2013, a full 15 years after her initial diagnosis, Jody was diagnosed with metastatic breast cancer. The exact same breast cancer that was "successfully treated" in 1998 made its appearance yet again ... not in a breast or scar tissue, but in the lymph system throughout her neck and gastrointestinal area. Only three years later, Jody died of this disease, yet another statistic that isn't acknowledged very often in the pink aura of success. How does breast cancer do that? How do cells escape from an original tumor and nest somewhere in the body, eluding all treatments thrown at the disease and mysteriously "wake up" and start moving around the body again fifteen years later? What gives them the ability to hide? What triggers their activation again? What makes them so resistant to treatments? Why can't they be stopped? How do we know who has had breakaway cells versus those who haven't? It's been said that early detection of metastatic cells isn't very helpful because there isn't proven effective treatment across the board that will successfully kill off those cells. Where does that leave us? The exact number of those with early stage breast cancer that become metastatic is unknown. 30% gets thrown around a lot, but statistically speaking, it's been unproven. However, does it really matter if the real number is 20% or even 10%? There are a projected 246,660 new cases of breast cancer in the United States alone in 2016. There is no comfort in a 10% figure of 24,666 metastatic recurrences versus a 30% figure of 73,998 metastatic recurrences. Early stage women (and men) are often told that they can breathe easier if there is no metastatic recurrence within five years of their primary diagnosis. To be frank, that "comfort" statistic really only applies to triple negative breast cancers. The statistical chance of triple negative recurrence drops sharply after three years and becomes almost zero after five years. Unfortunately, this is not true for all the hormone related breast cancers as well. It wasn't true for Jody. Her breast cancer came back after FIFTEEN years! It wasn't true for Mary Margaret in my local mets support group. Her metastatic disease was diagnosed TWELVE years after her primary diagnosis and her doctors (yes, the medical community) were stunned that the disease returned after so long. Mary Margaret lived two years with metastatic breast cancer before she died. Five years means nothing to Lydia whose disease returned after TEN years. Or to Laurel whose disease returned after FOURTEEN years. These years are why we need to change the current model of how we look at breast cancer. We need to move past the "treated and done" mentality and placing those "survivors" into neat little pink envelopes asking for money to continue the "successful war on breast cancer." We're not successful. It's not enough that we treat those 246,660 women (men aren't included in that particular statistic) and simply wait and see what happens to them. We need to be proactive in determining how to protect them from the possibility of metastatic recurrence. (This doesn't include the 14,800 - 24,666 women (6-10%) who are diagnosed metastatic from the beginning.) We need to know how to successfully kill off metastatic breast cancer cells before they kill us off. We need to keep educating the general public that it's not enough to put on the survivor ribbon and parade in the streets wearing pink declaring that differences are being made. Until we stop this disease in its tracks, both before it begins and after it has spread, there is no victory. There should be no parades, no cheering, no "we have overcome" and certainly no races "for the cure" when the sponsoring organizations continue to tout the "success" of early detection and early treatments with little attention actually going "for a cure." Tell those "successes" to the 40,000+ who die each year in the US alone. Tell them how triumphant we've been in dealing with metastatic disease, the only kind of breast cancer that kills. I can hear your voices, but I can’t muster up the energy to open my eyes to talk to you. I know you are there, though, and that brings me comfort. I know you will be there for my husband when I’m gone. I often wonder how he will live without me. He has been so faithful in caring for me. He loves me with all his heart as I do him. Oh, how I love him! It breaks my heart to leave him. I don’t regret my choices. I don’t mind that I never had children. I have had so much joy in my life. I know I’ve always looked younger than my years. People always gasp when they hear I’m 66. I had a big party for my 65th birthday. I didn’t know how many birthdays I had left … and I wanted my friends from various walks of my life to meet each other. It was such a fun birthday and I’m glad I did it because I was pretty sick for my 66th and I doubt I will live until my 67th at the end of June. I don’t even think I’ll live until the end of this week. Most people would say that I’ve had a full life and indeed, I have! I’m so grateful for everything I’ve gotten to do. However, I want so much more! 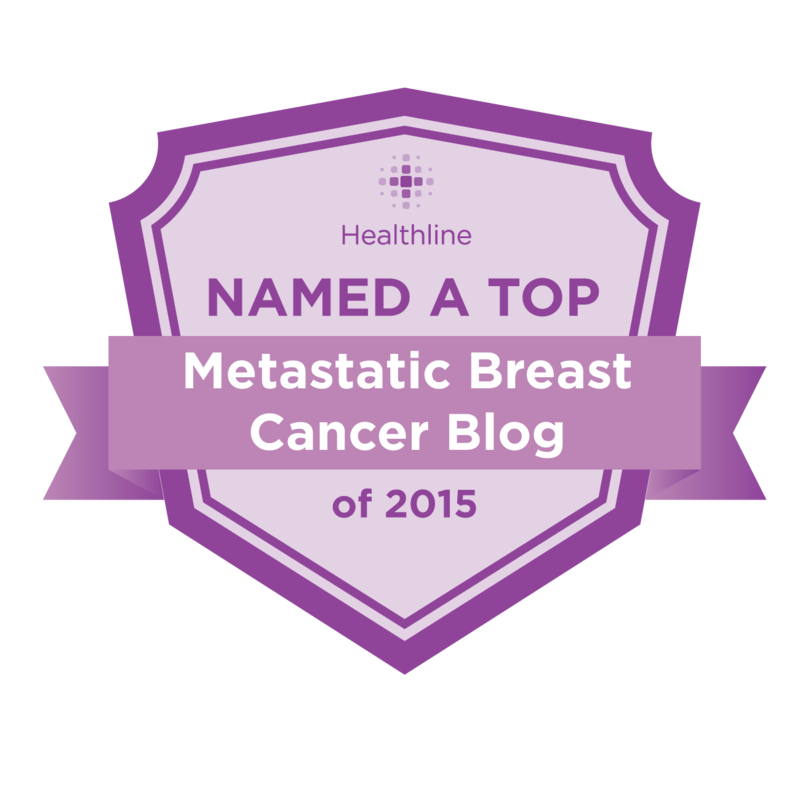 My life expectancy without metastatic breast cancer is 80 – 90 years old … I’m leaving too soon. That’s just not true. It’s so very, very sad. I may not be an important person in this world, but I know I’m important to some people. I’m not even the average age of death for metastatic breast cancer yet … that number is 68 and I know that’s an impossible age for me to reach. I feel like my life is a disposable one when it comes to metastatic disease. I used to support organizations directing funds to metastatic research but it became easier to direct donations to my own research oncologist as she has given me more time with my beloved husband than we ever expected to receive. Social media has created a huge social divide. While I know that everyone with metastatic disease needs support, I have never seen anything like “Senior Citizens Breast Cancer Group” or “The Unique Needs of the Older Woman with Breast Cancer” whereas I see “Young Survivors … “ or “Young Women with Breast Cancer” or “Young Women’s Breast Cancer Unique Needs” all the time. I think what is often forgotten is that I’ve been young before. I understand the dreams and aspirations. I’ve walked that road of life and now I’m walking the same road of death. I am so incredibly sad for anyone with this disease. It’s not fair for anyone. My heart breaks for the young women who die. My local support group has lost several in the past two years. However, we have also lost several older women and their loss is equally tragic. We have a hard time bouncing back from these deaths because we know our time is coming. My time is coming soon. I hear your voices as you talk to me. I know you are there. I know you love me. I wish I could wake up enough to tell you that I love you, too. Neither young nor old, she easily blends into a crowd. At first glance, her soft graying hair would seem to place her in the senior citizen category, but a closer look at her face reveals the absence of fine lines and wrinkles that should go with the hair. When you listen to her talk, you hear her proudly talk about teenagers … not grandchildren, but her own children. Motherhood came late for her … early 40s … yet she doesn’t generate the same sympathy as someone a decade younger with the same age children. Her parents are no longer able to help care for either her or her children. In fact, this woman is a member of the sandwich generation in which she not only cares for her teenagers, but also cares for her aging parents as they navigate the uncertain path of dementia and other age-related issues. As doctors try to figure out how to slow down the disease ravaging her body, they continue to check for any mutation that could give clues as to why repeated treatments are failing. Test after test after test comes back negative for mutations. She does not qualify for clinical trials due to either too many prior treatments or due to the fact that she doesn’t have the “x-factor” the clinical trial is targeting. In short, her garden-variety, very average, hormone positive breast cancer isn’t “interesting enough” to warrant further study from a clinical viewpoint. You would never be able to tell this woman is sick simply by looking at her. She has lots of energy, but her life is slipping away. She can tell the differences in her body from one year to the next and deep down, she knows, barring a breakthrough treatment, that her time is limited. Yet, she is seldom talked about or seldom seen. When one looks closely at stock photos for breast cancer awareness fundraisers, she’s the invisible one in the crowd. If she’s there, she won’t be flashing a brilliant smile of survival, but will be standing off to the side, wincing at the pain of it all. She wonders how women older than her feel … those already in their 60s and 70s … and the seeming lack of awareness that the average age of diagnosis of breast cancer is 61 and the average age of death to metastatic breast cancer is 68. This means that half of the women who die of metastatic breast cancer are older than 68 years old ... but too often, the only ones talked about are those under age 50. Even at events that feature those with metastatic breast cancer, her presence is unnoticed. The focus continues to be on those younger than her. It's been an incredibly challenging month. Back in early April, I had a bit stronger dose of chemo to prepare for my ten-day trip to the East Coast and the very next day, I started having difficulties breathing. I"m still having difficulties breathing and it's been determined that the childhood asthma that hasn't made an appearance in my life since I was 12-years-old has made a reappearance. Sigh, cough, cough. I could handle asthma if it had stopped with that. But no, stomach issues settled in as well. I've had trouble eating and I struggled with keeping food down on my trip. I ran random fevers. I coughed way more than I wanted to. I vomited more frequently than anyone would be comfortable. I returned and had scans my first day back. They were encouraging ... nothing in my lungs and my liver seemed to be improving. However, my blood work said the opposite. My liver function tests (LFT) rose to alarming heights and I continued to have stomach issues. More blood work continued to show alarming trends in the LFTs. My appointment last week ended with my oncologist saying, "I'm worried about you." Two days after that appointment found me in the emergency room after waking up at 4:00 a.m. doubled over in pain. Nothing I had experienced the previous few weeks could compare to that pain and I knew something was seriously wrong. A doctor friend helped me decide to go in and she contacted the emergency room doctor (another friend) to get his opinion as well. He was scheduled to work that day and told us he would meet us there. A few hours later it was determined that I had a partial bowel obstruction. I was given a few meds to help clear my system out; a soft diet to follow and the ongoing request to rest. That's an easy one because after a month of feeling poorly, I get quite tired. The good news is that as of today, I'm feeling much better. I ate real food today without having any pain at all. Only the breathlessness and coughing remains. Additionally, I had blood work done and my LFTs are dropping! What the heck? Did the bowel obstruction cause them to rise? Or, did the fact that I had gone three weeks without chemo cause them to rise? We may never know. I recognized immediately that even those of us who live with this horror every day can slip into what can be considered cliches, but to give myself a bit of credit ... I was genuinely interested in how he was doing. I followed up my words with a very straightforward, "Tom, what a stupid thing to say. I know how you are doing, but at the same time, I don't know how you, as a beloved husband and as my friend, are doing." Tom, the gracious man he is, set me at ease, saying, "Of course, I understand what you mean. You're allowed to say such things to me because you know there is absolutely nothing good about this situation. Helen's cousins are visiting and I'm on my way to the gym." That answered my immediate question regarding concern for him as the caregiver. I ache all over at the thought of Helen leaving us. Diagnosed Stage IV de novo in September 2012, we were hoping for many more years. We simply can't take things for granted. My husband and I are trying to plan a family vacation for the four of us and it's no longer a simple matter of picking a week and making plans. We have to plan around scan schedules, chemo schedules and choose locations that are easy to get medical care, if necessary. Accommodating job schedules, the end of school, the beginning of school, etc., means a juggling act to make it happen. So this is a simple, everyday kind of post. Living with disease, suffering with illnesses that may or may not be related to disease, losing one friend while preparing for the loss of another friend and more living with disease. I guess I wouldn't have it any other way, but given the choice, I think there are a few things about my life that I would change.